What are some little known books you adore? All the covers are so nice, for sure will check these out, always looking for new reads! So many books I wish got more love. Most of what I read will be low rated as I read a ton of Indie books! And we know Indies don't tend to get as much love, but all of these are big press books. Like I said, I read off the beaten path, but I love supporting those less hyped books. We Regret to Inform you and Hidden Pieces sounded damned good! Great list, Sam! We Regret to Inform you was such an interesting look at the college application process with a bit of OTT in there for fun, and Paula Stokes is always good for me. I am such a fan of all her books. The Geography of Lost Things has been on my TBR for a while now. Invisible Ghosts sounds really good too. Both were fantastic grief and loss books with Ghosts actually having a little paranormal spin. Loved them both! I love that we both have Four Three Two One on our lists! I'm hoping it's only because it's rather new, and more people will read it soon. Wild Bird is another great one! I am such a fan of Stevens' books. I have loved every one I have read. I read Flipped and then went on a mission to read any Van Draanen book I could find in the library. Her writing is something special. I bet if I did an adult list, which you know would really be all contemporary romances for me, you would have maybe read a few. With the amount of books some bloggers haul, it's near impossible for them to read them all, and I guess these didn't make the cut. It's a shame, because they were all really wonderful books. All Johnson's cover's have the same look and feel, so you could be thinking of Fix or her newest book, which is making the rounds. I adore her book. All three were wonderful! This is my YA book. I will probably take a look at my adult books at a later date, and I feel like there are not as many YA contemporary bloggers out there, whereas I am dedicated to contemporaries. The Man Who Loved P & P looks interesting. I may have to check that one out. You read so many books, it's not surprising that some of them are hidden gems! I have a copy of That Night, I have to read it. Sometimes I feel like the bulk of my books are hidden gems. I feel like the lone YA contemporary blogger in a sea of SFF readers. Curious about Wild Bird, since I loved her novel Flipped so much. I went and binged as many of Van Draanen's books as I could get from the library after I read Flipped and they were all so good. I really liked Geography of Lost Things. I have Four Three Two One and Hidden Pieces though and need to get to them. I have a copy of the Paula Stokes book in my pile that I need to get read. I still want to read We Regret to Inform You. It sounds good. Thanks for sharing your Hidden Gems, I love reading books that don’t get as much buzz. I like Kaplan a lot. I love her humor and feel like she is so underrated. Stokes is under appreciated too, because I have yet to read something by her that I didn't find fabulous. I STILL have Wild Bird to read. It's been sitting on my shelf and I need to get to it. And Paula Stokes is another author I've been meaning to get to- Hidden Pieces had me curious, and so did Geography of Lost Things. I recommend basically any book by Van Draanen. Her books are fantastic. I have nothing but love for Brody and Stokes too. They have yet to disappoint me. I love all of the covers for these books. Very eye-catching. I am a cover-ho, so pretty covers will always warrant my attention. I haven't read any of these. I read loads of indie titles but I struggled to find 10 this week. Maybe I just didn't look hard enough, lol. I find it fascinating that your list is traditional publishing heavy yet under 2000 on GR. It says a lot about the variety and amount of options available now, I think. I haven't read any of these, but I do know of a few of them! I've heard great things about Wild Blue Wonder! I loved both Soroisak's books. She delivers a great YA contemporary involving family and friendship, which always work for me. I like the look of The Geography of Lost Things. I'll have to check it out. Geography was a really well done story. I love road trip and grief books, and Brody kept it interesting with the Craig's list swapping and complicated romantic subplot. Considering I read mostly big pub books, it's surprising how many of my books are little known. Sometimes I just don't know why certain books don't have a lot of ratings. Hopefully people are reading them that don't use Goodreads. LOL Thanks for all these rec's. I find when I am out on book twitter or bookstagram, it's dominated by fantasy books or a few huge contemporaries. I will also see people hauling the books, but I guess they don't get to them, because I review a lot of books, which I never see around the blogosphere. Kaplan's books are fabulous. I am so excited for her new one! A few of these books are in my tbr already! Glad to hear you love them so much! I hope you get to them someday, because they were all wonderful for me. Thanks for sharing some new to me authors. 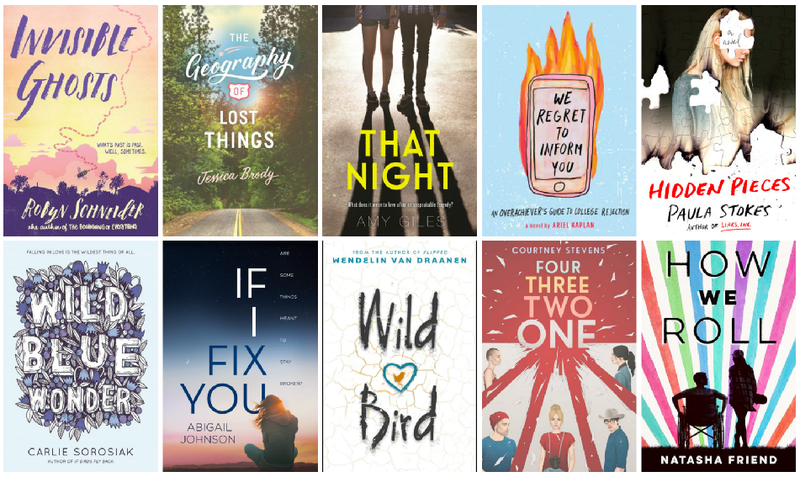 If you ever get an itch to read some YA contemporary, these were all fabulous. I loved both Kaplan's books, but there was something extra special about Regret. Her writing is great and the story was fun and had substance. Looks like a great lineup. What does it mean when you say they have under 2K ratings? Is there something wrong with it? Do they get in trouble? Is there a special meaning to this? I don't know the significance of this and have seen it before. Can you explain it to me? More ratings, means more people are reading the books. I would think a lot of ratings plus book sales would equal success. I don't know if people are reading the books and not rating or these are just books that are falling through the cracks. Either way, I am happy I found them all, because they were wonderful. I have The Geography of Lost Things and I LOVE Brody but haven't read it yet for some reason. I love all that is both Brody and Van Draanen. I am so happy I found both of those authors. YESSS to Four Three Two One! Such a favorite! I also really liked Hidden Pieces. I need to read a lot of these, but especially want to read Wild Blue Wonder and If I Fix You- I have heard AMAZING things about the latter, but the former has always been on my radar too! Pretty curious now about Invisible Ghosts and That Night too, and now I want to go back and read all your reviews on the others! Thanks for sharing these with us! I am always screaming for those little books. They need love too. It's hard to read them all. I am lucky to have access to so many books, and also, to read so many. It gives me a freedom to explore a lot more, than people who have to buy all their book and maybe don't have as much time to read. I really adored each and every one of these books. If you have access and the time, I think they are all worth reading. I am sure I have many other gems on my wishlist too. I usually will cave on a hype book at some point, but I love giving the less talked about titles a look, if they fit with my tastes.